Now, full disclosure: I’m probably not who this book is aimed at. I worked as a documentary producer on the Doctor Who DVD range for six years, so I have a bit of a vested interest in a book that claims to be “your ultimate companion to the complete range”. I have an unhealthy familiarity with my Doctor Who DVD collection – the folk who this book is aimed at probably do not. The book takes the form of a full catalogue of the classic range – “every disc, every episode, every extra”. Each story between An Unearthly Child and Scream of the Shalka gets its own entry, with a collection of basic facts (“TARDIS Team”, “First on TV”, etc…) as well as a bit of blurb on the plot and story significance followed by a breakdown of all the special features included on the DVD of that story. Essentially, it’s a new spin on Jean-Marc Lofficer’s well-thumbed Programme Guide with an added dose of DVD info if you can’t be bothered to pull the disc off the shelf to see what’s on it. On the one hand, I’m sure this book will be useful to some as a reference for their existing DVD collection, or as a guide to what’s out there for new fans to start exploring the show’s rich history, but on the other, it frequently feels like a missed opportunity to genuinely sum up and explore the classic DVD collection. The Compendium is almost completely bereft of any insight into the making of the range. If the writer had looked to put together an essay or two of interviews with the likes of Steve Roberts and Mark Ayres of the Restoration Team or range overseer Dan Hall, it could have given a real, exclusive insight into why the range has come together the way it has – and, believe me, there are plenty of stories to tell. Additionally, details of the special features and commentaries (surely the information this book exists to supply) are depressingly prosaic, with no attempt to evaluate or contextualise the feature. What you’re left with is simply a list. The other strange decision is that the stories are presented in alphabetical order. The argument presumably being that it makes it easier to look up a particular story, but come on – Who fans are so stuck in their ways that anything other than strict broadcast order is going to set everybody’s OCD off. Even new fans coming to the classic run for the first time are going to be thinking in terms of First Doctor, Second Doctor etc – that’s how we’ve all been (rather sensibly) trained to view the show’s history. Why fight it? Now, full disclosure: I could be being a right old grump. This book may be just a list, but so was Lofficer’s Programme Guide – and as a young fan, I bloody worshipped that book. It may have been entirely lacking in frills, but it was my first portal into the history of Doctor Who. I preyed upon its every word and absorbed every nugget of information. It was only a list – but what a list! 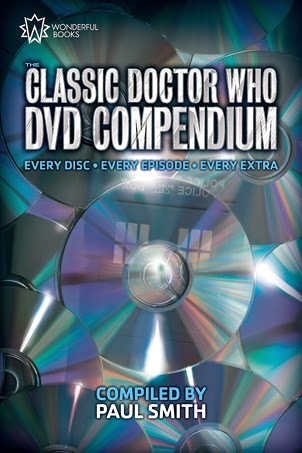 I’m sure to some out there, the Classic Doctor Who DVD Compendium will be just such a list. It’s not right for me, but it may well be perfect for them. Previous articleWorld Tour Hits Mexico! Next articleSeries 8 episode titles revealed! I received this book a little while ago and frankly I'm quite baffled by the opinion of the reviewer (who is acknowledged in the book, no less). Mr. Chapman goes on to mention that it is a pity that the making of the Doctor Who DVD range isn't comprehensively dealt with in the book. Although I would indeed be very interested in these details (and I hope one day they will be published in some way or form) it should be pointed out that the book is not aimed at detailing how the range came to be, but to summarise what can be found on the DVDs and where. And it does so brilliantly, in over 400 pages. In my opinion this book is a must have for every Doctor Who fan being the proud owner of classic era DVDs. Giving it 4/10 because it lacks a making of the DVD range or because the stories are listed alphabetically seems rather strange to me. I'd rate it 9/10.